I'm modifying my simple 8 voice sampler which I have been using for sometime now. It is an 8 voices monotimbral sampler with an audio input for another instrument for live situation (my dx100 audio and midi go to the Axoloti, then I used a usb midi controller to switch between the DX and the Sampler). 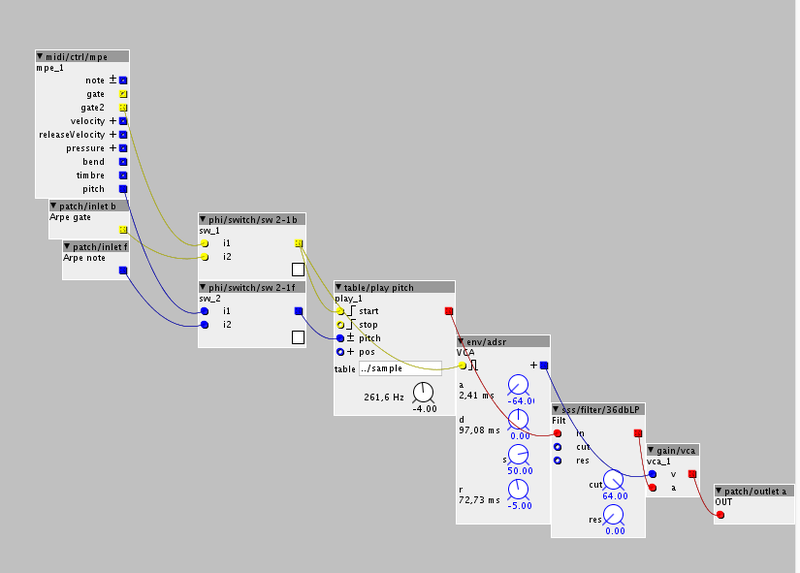 I'm adding an arpeggiator, I'm using @cpwitz arpeggiator module, it will be affecting the sampler itself but also be able to mirror its output to the midi out to control an nord micro modular. Does the arpeggiator needs to be inside the Poly voice from my sample or can it be outside with inlets as pictured here? Does the switching (controlled by midi) for the on/off of the arpeggio make sens? I'm switching between the classic midi in and the arpeggio, I'm not sure this will work if I want to keep the pitchbend control active. I want to control some integer (green input) values via midi, can I use a F controller and map its range? Your patch example looks correct. Don't put the arp into a polyvoice subpatch. It should live on top-level and distribute it's gate and pitch from there. Actually I can't imagine if it would work and what I will do inside a poly subpatch. Yes, that's exactly how you would do it. The inlets are green to visualize, that only integer values are recognized. If you put a f to the green inlet an input like 3.125 would be interpreted as 3. I think, you'll have to experiment to find a solution. I would consider using one of the midi thru objects from the community library (e.g. tb/midi/utils/midithru, sss/midi/THRU) and extend them with an "enabled" switch or inlet. Then you could toggle between arp or through. switching between playing classical key and the arpeggio to the sampler. being able to mirror the arpeggio to the midi din out with an on and off switch while keeping the USB midi thru to din out always active. but then I would like to be able to use mix those possibilities (for example arpeggio on both, or just one of the two or none).